Clinical and low passage strains of human CMV (HCMV) encode an additional MHC class I-related molecule UL142, in addition to the previously described UL18. The UL142 open reading frame is encoded within the ULb′ region which is missing from a number of common high passage laboratory strains. Cells expressing UL142 following transfection, and fibroblasts infected with a recombinant adenovirus-expressing UL142, were used to screen both polyclonal NK cells and NK cell clones, in a completely autologous system. Analysis of 100 NK cell clones derived from five donors, revealed 23 clones that were inhibited by fibroblasts expressing UL142 alone. Small-interfering RNA-mediated knockdown of UL142 mRNA expression in HCMV-infected cells resulted in increased sensitivity to lysis. From these data we conclude that UL142 is a novel HCMV-encoded MHC class I-related molecule which inhibits NK cell killing in a clonally dependent manner. Human CMV (HCMV)3 is a ubiquitous persistent DNA virus which is an important cause of disease in immunosuppressed subjects. It is the largest human herpesvirus and has an intricate relationship with the immune response: cellular immune responses control the infection, but HCMV encodes multiple mechanisms apparently designed to evade these responses. The ability of HCMV to interfere with the normal processing and eventual cell surface expression of MHC class I molecules is well established: during in vitro infection specific viral genes (US2, 3, 6, and 11) cause the level of cell surface MHC class I molecules to progressively diminish. NK cells are normally restrained by signals received through their inhibitory NK receptors which interact with MHC class I molecules on the surface of the target cell: these reduced levels of surface MHC class I on HCMV-infected cells are likely to compromise negative signals to host NK cells (1, 2, 3), leading to the suggestion that HCMV might also need to evade NK cell recognition. A number of experimental systems show that HCMV-infected cells can become refractory to NK-mediated lysis, suggesting that HCMV has indeed evolved virus-encoded functions to evade NK surveillance (4, 5, 6, 7, 8). Until very recently three distinct HCMV-encoded mechanisms have been proposed to inhibit NK cell activation and lysis of infected cells: 1) expression by HCMV of a viral MHC class I homologue, gpUL18. gpUL18 has been shown to bind the inhibitory receptor LIR-1/ILT-2 with 1000 times the affinity of endogenous MHC class I (9). This was originally believed to inhibit NK lysis (4), although this is controversial (10), and whether UL18 provides positive or negative signals to certain NK clones remains unclear. 2) Engagement of the inhibitory C-type lectin heterodimer CD94/NKG2A on NK cells by HLA-E. This class I-like molecule is up-regulated on HCMV-infected cells due to its stabilization by a peptide homologous to an MHC class I leader sequence derived from HCMV UL40 (6, 11), although another group did not see this effect (12). 3) Binding by the viral membrane glycoprotein UL16 of a number of the natural stress-induced ligands (ULBP/RAET/MICA) for the activating homodimeric NK receptor NKG2D. This results in their sequestration in the endoplasmic reticulum (ER)/cis-Golgi preventing NKG2D engagement and associated NK-activating signals (5, 13, 14, 15). 4) A structural protein (pp65) from the virus tegument has been shown to interact with an activating NK receptor NKp30 leading to reduced NK cell-mediated killing (16). A comparison of the ability of fibroblasts infected with different strains of HCMV to resist NK-mediated lysis has demonstrated striking differences between the laboratory adapted strain AD169 and strains of the virus that are more closely related to recent clinical isolates, including Toledo (7, 8). Because both laboratory adapted and clinical strains of the virus possess the UL16, UL18, and UL40 open reading frames (ORFs), these observations imply that there are additional genes in clinical isolates of HCMV which are responsible for their NK cell inhibitory phenotype. Fletcher et al. (8) reported that clinical strains of the virus down-regulated LFA-3, whereas AD169 did not, and speculated that this may be responsible for the difference in phenotype. However, Cerboni et al. (7), while also able to show this difference in NK cell inhibition between clinical and laboratory strains, were not able to show any correlation with LFA-3 down-regulation. It has been recognized since 1996 that clinical isolates of the virus have a larger genome: comparison of the AD169 and Toledo genomes shows a 13.5-kb insert (ULb′) in Toledo, which is absent from AD169 and codes for a putative 20 ORFs (17). This ULb′ region has recently been reanalyzed and some of the genes in this region reassigned (18). It thus seemed likely that genes encoded in the ULb′ region might be responsible for rendering infected fibroblasts resistant to lysis by NK cells, and we consequently sought to characterize these genes. A recent publication has shown that one of the genes in the ULb′ region, encoded by ORF UL141, is able to inhibit NK cell-mediated lysis, in a clonally dependent manner, by sequestering CD155 in the ER and thus preventing it from engaging DNAM-1, a NK- activating receptor (19). To identify possible additional HCMV-encoded NK cell inhibitory genes, we established an autologous system for the analysis of NK cell inhibition by different strains of HCMV: we confirmed the previous observations that clinical strains of HCMV inhibit the NK lysis of infected cells, and demonstrated that this occurs late in infection when cell surface MHC class I is maximally down-regulated. We have identified the UL142 ORF contained within the ULb′ region of clinical isolates as a novel viral MHC class I-related molecule that is expressed late in infection. We constructed a GFP UL142 fusion protein and demonstrated that UL142 can exist at the cell surface and is a heavily glycosylated protein. We found that UL142-expressing cells are more refractory to NK lysis than control cells: analysis of individual NK cell clones shows they display a phenotypic spectrum of susceptibility to inhibition of their cytotoxicity, about a quarter of these clones being inhibited by UL142 expression. Knockdown of UL142 expression in HCMV-infected cells by small-interfering RNA (siRNA) transfection increases their susceptibility to NK cell-mediated lysis, as compared with a control siRNA. Taken together, these data show that HCMV UL142 is a novel virus-encoded MHC class I-related molecule which inhibits NK cell killing in a clonally dependent manner. Primary human fibroblast lines were established from normal healthy HCMV seropositive and seronegative laboratory donors from skin biopsies as previously described (20) and maintained in tissue culture medium EMEM-10 (Eagle’s MEM supplemented with 10% FCS, 2 mM l-glutamine, 105 IU penicillin/L, and 100 mg streptomycin/L (Invitrogen Life Technologies). Fibroblast lines were suspended in 10% DMSO (Sigma-Aldrich) and 90% FCS and cryopreserved in liquid nitrogen to provide long-term stocks. U373 cells (an astrocytoma cell line) were maintained in EMEM-10. U373 cells stably expressing UL142 were produced by transfection using calcium phosphate coprecipitation with plasmids pCMV-Tag UL142 and selection using G418 at 1 mg/ml. Primary NK cell lines and clones were established from PBMC of HCMV seropositive and seronegative donors. PBMC were prepared from fresh heparinized venous blood samples by Ficoll-Hypaque (Lymphoprep; Nyegaard) density gradient centrifugation. NK cells were enriched by negative depletion using MACS columns (Miltenyi Biotec). A total of 2 × 107 PBMC were stained with mAbs to CD3, CD14, and CD19 all FITC conjugated (Caltag Laboratories); the cells were washed and stained with anti-FITC MACS beads (Miltenyi Biotec) for 30 min on ice. The cells were resuspended in MACS buffer and loaded on to a LS column (Miltenyi Biotec): the pre- and post-column populations were monitored by flow cytometry and the flow-through contained the negatively selected NKenriched population. Polyclonal NK cell lines were established by plating 2000 cells/well in 50 μl of RPMI 20 (10% human AB, 10% FCS) (Invitrogen Life Technologies) in 96-well U-bottom microtiter plates (Costar; Corning). Each well was stimulated with 50 μl of a mixture of 50 U/ml rIL-2 (NIBSC), 25,000 irradiated allogeneic EBV-transformed B cell lines (BCL), and 25,000 irradiated autologous PBMC. Plates were incubated at 37°C with 5% CO2 and refed with 50 μl of RPMI 20 supplemented with a final concentration of 50 U/ml rIL-2 on days 5 and 10. Polyclonal lines were established after 2 wk in culture and were maintained by subculturing the lines and restimulating them with a mixture of 50 U/ml IL-2 and 1 × 106 irradiated allogeneic BCL and 1 × 106 allogeneic PBMC/ml. NK cell clones were established by limiting dilution culture: enriched NK cells were plated in 96-well U-bottom plates at 10, 5, 2, 1, 0.5, and 0.25 cells/well (one plate at each cell density), and stimulated with 50 μl of a mixture of 50 U/ml rIL-2, 25,000 irradiated allogeneic BCL, and 25,000 irradiated autologous PBMC. Plates were incubated at 37°C with 5% CO2 and refed with 50 μl of RPMI 20 supplemented with a final concentration of 50 U/ml rIL-2 every 5 days. Growing wells were evident after 2–3 wk in culture, and were subcultured and restimulated using the same protocol as for polyclonal NK cells. NK cell clones could be maintained in culture for between 6 and 8 wk before they stopped proliferating. Full-length UL142 was obtained by PCR of DNA extracted from Toledo-infected fibroblasts which also incorporated an EcoRI site in the forward primer (5′-ggc gaa ttc tat gcg gat tga atg ggt gtg g) and SalI site in the reverse primer (5′-tta gtc cac tta ctg acc gcg cca tac ctc). These PCR products were inserted into the CMV-Tag 2a vector (Stratagene). An N-terminal GFP fusion was generated by inserting a PCR product of UL142 generated using a forward primer which excludes the predicted leader sequence and incorporates an XhoI restriction site (5′-CAACTCGAGGAACGGTCATTATCCTAT) and a reverse primer containing an XbaI restriction site (5′-GGTTCTAGATTACTGACCGCGCCATAC). This fragment was inserted into PK1-UL18 (provided by Drs. L. Boyle and H. Reyburn, University of Cambridge, Cambridge, U.K.) after digestion of the plasmid with XhoI and XbaI (Promega) and ligation with T4 DNA ligase (Promega) the UL142 PCR product. A UL142 C-terminal GFP fusion was generated using forward PCR primers which incorporates an EcoRI restriction site and a KOZAK sequence (5′-CAAGAATTCGCCACCATGCGGATTCAATGGGTG) and reverse with a BamHI restriction site and no stop codon (5′-GGTGGATCCCACTGACCGCGCCATACCTC). The UL142 PCR product was ligated into mammalian expression vector pEGFP-N1 (BD Biosciences/BD Clontech). All constructs were verified by sequence analysis (MRC GeneService, University of Cambridge, Cambridge, U.K.). HCMV strains AD169 (ATCC VR-538), Toledo (a gift from R. Greaves, Imperial College, London, U.K.), and TB40/e (a gift from G. Jahn, University of Tubingen, Tubingen, Germany) were grown in human foreskin fibroblasts (HFF). Briefly, confluent 150 cm2 flasks of HFFs were washed once with PBS and then infected with virus at a multiplicity of infection (moi) of 0.1 after 1 h fresh tissue culture medium was added and the infected cells incubated at 37°C in 5% CO2. Four days after >90% of the cells were showing signs of cytopathic effect (cpe), the tissue culture supernatant was harvested and replaced with fresh medium. This was repeated daily until the cell monolayer was destroyed. The virus supernatants were then aliquoted and frozen at −70°C from each harvest. An aliquot from each time point was used to infect a 25 cm2 tissue culture flask of HFF cells, and cpe was assessed 24 h later. Viral stocks demonstrating >90% cpe were retained, and viral titer was determined by plaque assay. Construction of replication-deficient adenoviruses, RAds, has been described previously and was based on the AdEasy-1 vector system using a deletion of the E1 gene region with the transgene inserted downstream of the HCMV major immediate early promoter (21). The UL142 gene was amplified from Toledo genomic DNA by PCR using AGS Gold polymerase (Hybaid) with the following primers: forward, 5′-AATATGCGGATTGAATGGGTG-3′; reverse, 5′-TTACTGACCGCGCCATACCTC-3′ (Invitrogen Life Technologies). The UL142 PCR product was inserted into the pCR2.1-TOPO vector (Invitrogen Life Technologies), generating pAL508. The sequence of the UL142 gene in pAL508 was confirmed by sequencing using BigDye Terminator cycle sequencing kit (Applied Biosystems) on an ABI PRISM 377 sequencer. The UL142 gene was cut from pAL508 as a KpnI/XhoI fragment and inserted into KpnI/XhoI cut pShuttle-CMV, generating pAL579. The pAL579 was cut with PmeI and recombined with pAdEasy-1 in Escherichia coli BJ5183, generating pAL586. The correct pAL586 clone was selected by restriction digest analysis. Purified pAL586 DNA was then cut with PacI and transfected into 911 cells generating the RAd, RAd586. RAd592 was used as a control virus for RAd586 throughout the study. RAd592 does not drive expression of any transgenes. RAd592 was generated as follows: plasmids pShuttle-CMV(cut with PmeI) and pAdEasy-1 (both provided by Dr. B. Vogelstein, Johns Hopkins Oncology Center, Baltimore, MD) were recombined in E. coli BJ5183, generating pAL592. The correct pAL592 clone was selected by restriction digest analysis. Purified pAL592 DNA was then cut with PacI and transfected into 911 cells, generating viable RAd RAd592. Target cells consisted of autologous primary human fibroblasts infected with the AD169, Toledo, or TB40e strains of HCMV at an moi of 2 for 24, 48, or 72 h. Infected fibroblasts were washed once in PBS and then detached by trypsinization (Sigma-Aldrich). The trypsin was neutralized using fresh medium, detached fibroblasts were isolated by centrifugation and washed twice with PBS. The target cells were loaded with 51Cr (sodium chromate, 10 μl/106 target cells; Amersham), incubated at 37°C for 45 min, and then washed three times in RPMI 10. K562 cells were used as a positive control for NK cell cytotoxicity. NK and infected target fibroblasts were mixed in 96-well U-bottom plates in triplicate and incubated for 6 h at 37°C, 5% CO2. Supernatants were harvested with a Biomeck 1000 robot, radioactive counts were determined using a gamma counter (Beckman Coulter), and percentage-specific lysis was calculated as previously described (22). Expression of UL142 mRNA was determined by RT-PCR. Confluent 25 cm2 tissue culture flasks of HFFs were infected for 24 h with either AD169 or Toledo strains of HCMV in the presence and absence of cycloheximide (50 μg/ml) for 3 h before and during infection. Cells were cultured for a further 24 h before harvesting. Virus-infected cells were also cultured in the continual presence or absence of the viral DNA polymerase inhibitor Phosphonformate (100 μg/ml) for 72 h before harvesting. The infected fibroblasts were detached by trypsinization, and total RNA was isolated using the RNAeasy isolation system (Qiagen). The RNA was eluted in a final volume of 30 μl RNase-free water. Residual viral genomic DNA was removed by a DNase (Promega) treatment followed by a second round of purification on RNAeasy columns, according to the manufacturer’s protocols. First-strand cDNA was produced using the Promega RT system. PCR was performed using forward primer 5′-ATTGAATGGGTGTGGTGGTT and reverse primer 5′-TGAGGTCGCAAGTGTGATTC, which yields a 385-bp product (45 cycles of 94°C, 30 s; 60°C, 30 s; 72°C, 30 s). MRC-5 fibroblasts were grown in 8-well chamber slides (Nunc), and both UL142 GFP constructs were transfected using Lipofectamine 2000 (Invitrogen Life Technologies) and the manufacturer’s standard protocol. To distinguish between cell surface and total cellular expression, 48 h posttransfection the cells were stained with mouse anti-GFP Ab (Roche; dilution 1/200), followed by Texas Red-conjugated goat anti-mouse Ab (Molecular Probes; dilution 1/300). Mouse IgG1 isotype standard (BD Pharmingen; dilution 1/200) was used as the isotype control for the mouse anti-GFP Ab, cells were then fixed with 2% paraformaldehyde for 10 min, and viewed by confocal immunofluorescence microscopy (Leica). MRC-5 cells were grown in 6-well plates (Corning) and transfected with either the C- or N-terminal GFP constructs. Cells were harvested by addition of 300 μl of 1× Laemmli buffer to each well. A total of 2.5% 2-ME (i.e., 1.5 μl) was added to 60 μl of each transfection sample. The samples were heated at 90°C for 5 min. Samples were split and one-half were treated with Endo Hf (New England Biolabs) at 37°C for 1 h. Samples were loaded onto an 8% acrylamide gel and subsequently transferred to an Immobilon-P membrane (Millipore). The membrane was incubated with mouse anti-GFP Ab (Roche; dilution 1/1000 in 2% Marvel/0.05% Tween 20/PBS), followed by HRP-conjugated goat anti-mouse Ab (DakoCytomation; dilution 1/1000 in 2% Marvel/0.05% Tween 20/PBS). Detection was conducted using ECL Western Blotting Detection Reagents (Amersham Biosciences) and visualized by exposure to medical x-ray film (Fuji). Two siRNAs were designed to separate regions of the UL142 mRNA no. 1, sense (GGAAUCAGUUCGUCUUUAUdTdT), antisense (AUAAAGACGAACUGAUUCCdTdT), and no. 2, sense (UGACGGAACACACGUUAAAdTdT), antisense UUUAACGUGUGUUCCGUCAdTdT), using the Dharmacon RNA Technologies design and production service. A scrambled siRNA produced by Dharmacon was used as an siRNA transfection control in all experiments, sense (GCGCGCUUUGUAGGAUUCGdTdT) and antisense (CGAAUCCUACAAAGCGCGCdTdT). siUL142 nos. 1 and 2 were diluted to make a 40 μM stock, 4.8 μl of siUL142 nos. 1 and 2 or 9.6 μl of 20 μM scramble was mixed with 470.4 μl of OPTIMEM (Invitrogen Life Technologies). A total of 4.8 μl of LipofectAMINE 2000 (Invitrogen Life Technologies) was mixed with 475.2 μl of OPTIMEM and after 5 min at room tempreture the the diluted siRNA and Lipofectamine were gently mixed and incubated at room temperature for 20 min. Six-well plates were seeded with primary human skin fibroblasts in EMEM-10 without penicillin and streptomycin antibiotics overnight. Cells were washed and incubated for 4 h with OPTIMEM before transfection (960 μl of transfection mixture/well) followed by 4-h incubation at 37°C, after which EMEM-10 was added to each well and the transfected cells incubated overnight. Transfected cells were infected with HCMV at an moi of 2 and incubated for 72 h before use as target cells in cytotoxicity assays. 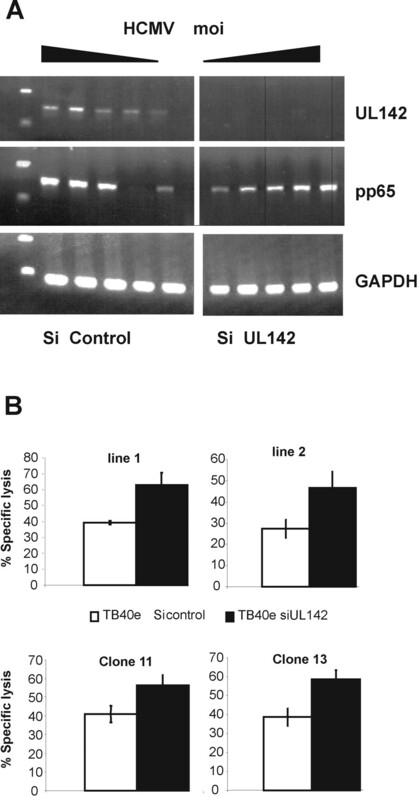 UL142 knockdown was determined for each experiment by RT-PCR and comparing the signal strength from HCMV-infected fibroblasts treated with siUL142 or scrambled siRNA. We routinely achieved 90% or greater reduction in UL142 mRNA expression. The proposed primary amino acid sequences from genes in the ULb′ region of HCMV Toledo (accession nos. UCBI U33331) were submitted to 3D-PSSM (web server, 〈www.sbg.bio.ic.ac.uk/3dpssm/〉), a bioinformatics tool that provides a method for protein fold recognition using one- and three-dimensional sequence profiles coupled with secondary structure and solvation potential information (23, 24). The UL142 ORF was further analyzed for Signal sequences: SignalP 3.0, 〈www.cbs.dtu.dk/services/SignalP/〉 (25). Transmembrane region determination was performed using TMPRED 〈www.ch.embnet.org/software/TMPRED_form.html〉. The number and position of N-glycosylation sites were predicted using the NetNGlyc server at 〈www.cbs.dtu.dk/services/NetNGlyc/〉. An autologous system was developed to examine both NK cell polyclonal populations and clones and used throughout this study to avoid target/NK cell effects mediated by nonautologous MHC class I molecules. Five fibroblast lines were established from normal donors, and autologous NK cells from these donors were used in all experiments. In these in vitro assays, both the E:T ratio and the time following IL-2 pulsing of the NK populations can affect lysis of autologous uninfected fibroblasts. Although it would be predicted that uninfected fibroblasts should resist lysis by autologous NK cells, we wished to investigate the ability of HCMV-infected cells to modulate NK cell function, and therefore chose to use conditions under which NK cells are able to lyse uninfected autologous fibroblasts–polyclonal NK cell lines, and clones were consequently used 4–5 days after IL-2 treatment over a range of E:T ratios of 5:1 to 20:1 (data not shown). It has previously been shown that fibroblasts infected with clinical strains of HCMV are refractory to NK lysis in an allogeneic system (7). We repeated these experiments using our autologous system, at immediate early and late times of infection (Fig. 1⇓A). Twenty-four hours after infection both AD169 and Toledo-infected fibroblasts could be effectively lysed by polyclonal NK cell lines at E:T ratios of both 10 and 20:1. However, by 72 h after infection, the Toledo-infected fibroblasts were highly refractory to NK cell-mediated lysis. Using polyclonal NK cell lines derived from two further HCMV seronegative, and two HCMV seropositive donors we observed a significant reduction in lysis of Toledo-infected fibroblasts by NK cells from all donors by 72 h after infection (Table I⇓). A, Fibroblasts become resistant to polyclonal NK cell lysis 72 h postinfection with HCMV Toledo. Chromium release assay (percent-specific lysis) using polyclonal NK cells against autologous uninfected or HCMV strain AD169 and Toledo-infected fibroblasts at 24 and 72 h postinfection, E:T ratios of 10:1 and 20:1. B, AD169 and Toledo-infected fibroblasts down-regulate class I MHC to the same extent over 72 h, but only Toledo-infected fibroblasts acquire resistance to lysis. Autologous fibroblasts were infected with AD169 or Toledo at an moi of 1–2 for 24, 48, and 72 h or left uninfected. Following trypsinization, an aliquot of the cells was stained with a pan anti-MHC class I Ab (shaded area) and isotype control Ab (open area) to determine cell surface expression by flow cytometry. The other aliquot of each target cell population was pulsed with 51Cr and then used as target cells against polyclonal autologous NK cells at E:T ratios of 10:1 (□) and 20:1 (▪). A possible explanation for the lack of NK cell-mediated killing at 72 h postinfection could be that Toledo infection does not extensively down-regulate MHC class I at this time. Consequently, we determined whether surface MHC class I on Toledo-infected fibroblasts was down-regulated to the same extent seen on AD169-infected fibroblasts. Fibroblasts were harvested at 24, 48, and 72 h after infection and their MHC class I expression determined by FACS. Aliquots of the same fibroblasts were also used as targets against autologous polyclonal NK cells. There was progressive down-regulation of MHC class I expression on AD169-infected fibroblasts, which correlated with a slight increase in target cell lysis (Fig. 1⇑B). However, although there was also progressive down-regulation of MHC class I on Toledo-infected fibroblasts after infection they still became progressively more refractory to NK lysis. As clinical isolates of HCMV were able to inhibit NK cell lysis even when surface MHC class I levels had been substantially reduced, we reasoned they either encoded proteins which directly mediated this effect or induced cellular responses that inhibited lysis. An analysis of the predicted ORFs of murine CMV (MCMV) using a bioinformatics tool 3D-PSSM, which aims to predict protein function from primary amino acid sequences, identified 11 ORFs that had MHC-like folds one of which, m157, was subsequently identified as a ligand for the NK receptor Ly49H (26). Subsequent investigations have shown that three other ORFs which had been identified as having MHC-like folds in MCMV, m145 and m155, were able to mediate NK evasion, as these molecules sequestered cellular ligands that would bind the activating NK receptor NKG2D (27, 28, 29, 30). We analyzed the predicted ORFs within the ULb′ region of HCMV Toledo using this approach. On the basis that scores below one may be significant, the application correctly predicted structures for HCMV UL144 (a TNF-like receptor) and UL147 (an IL-8-like molecule) which had already been recognized by separate methods (31, 32). The analysis suggested that ORF UL142 contained an MHC class I Ag recognition domain with a highly significant score of 0.000005. We also analyzed the UL142 ORF using an alternative method Pfam (〈http://pfam.wustl.edu/〉) which, again, predicted that UL142 had MHC class I-related domains. Independently, a comparison of the chimpanzee CMV genome with HCMV had identified UL142 as containing an MHC class I-like domain (18). UL142 is predicted to have an N-terminal signal peptide with a cleavage site between aa 19–20 and also to encode an α1 and disulphide bonded α2 domain. The α3 domain is truncated in comparison to classical class I MHC molecules. A transmembrane region is also predicted (TMpred score 1706) in the C terminus (SignalP-HMM probability 0.858) with an additional short cytoplasmic domain (Fig. 2⇓A). NetNGlyc analysis predicts 17 potential N-linked glycosylation sites of which five are predicted with very high specificity, suggesting UL142 is likely to be a heavily glycosylated protein. UL142 is encoded only in low passage and clinical isolates of HCMV, and is expressed as a late gene. A, Predicted domains in gpUL142. B, Only low passage and clinical isolates contain the UL142 gene. Lanes 1–4, UL142-specific PCR of uninfected fibroblasts, Toledo-, TB40e-, and AD169-infected fibroblasts, respectively. Lanes 5–8, IE-specific PCR of uninfected fibroblasts, Toledo-, TB40e-, and AD169-infected fibroblasts, respectively. C, UL142 mRNA is expressed as a late gene. IE1, UL142, and β-actin RT-PCR analysis. Lanes 1 and 2, AD169-infected fibroblasts at 24 h postinfection with and without cycloheximide (CxH). Lanes 3 and 4, AD169-infected fibroblasts at 72 h postinfection with and without PPF blockade. Lanes 5 and 6, Toledo-infected fibroblasts at 24 h postinfection with and without CxH. Lanes 7 and 8, Toledo-infected fibroblasts at 72 h postinfection with and without PPF blockade. Lane 9, Uninfected fibroblasts. DNA from fibroblasts infected with AD169, Toledo, and TB40e HCMV strains was analyzed by PCR using UL142-specific primers. As predicted, both Toledo and TB40e strains of HCMV contained the UL142 gene, whereas AD169 did not (Fig. 2⇑B). To determine the kinetics of UL142 mRNA expression, HFF were infected with Toledo at an MOI of 1 in the presence or absence of cycloheximide to block protein synthesis and RNA was then extracted 24 h after infection. In addition, fibroblasts were infected in the presence or absence of phosphonoformic acid (PPF) and RNA extracted 72 h after infection. RT-PCR analysis using primers specific for UL142, IE1, and cellular β-actin was performed on all the samples. The results showed that UL142 was only expressed at 72 h after infection and only in the absence of the PPF blockade. On this basis, UL142 is a true late mRNA (Fig. 2⇑C). As we do not currently have an Ab specific for gpUL142 we constructed two GFP UL142 fusions with GFP tagged to the N and C terminus to monitor protein expression. These constructs were transfected into human MRC-5 fibroblasts and used for confocal microscopy and Western blot analysis. Both N- and C-terminal GFP-tagged UL142 proteins were expressed in the cytoplasm of transfected cells. To determine whether UL142 could be expressed at the cell surface, unpermeabilized cells transfected with N-GFP-UL142 were stained with anti-GFP Ab followed by TRITC anti-mouse Ab and examined by microscopy. The results clearly show that N-GFP-UL142 can be detected at the cell surface (Fig. 3⇓A). 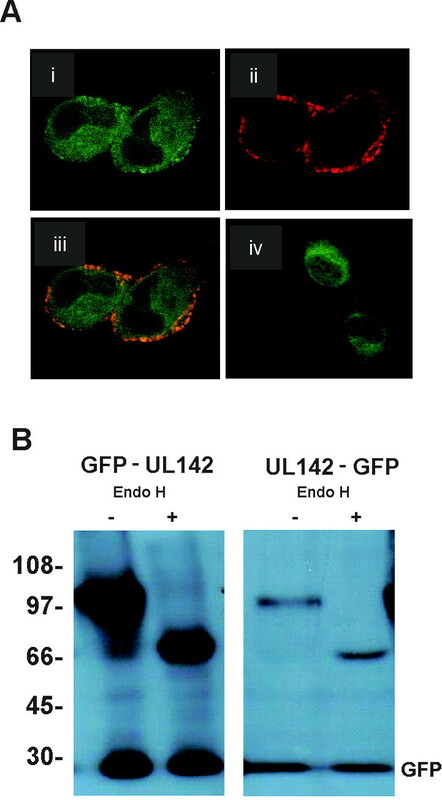 Western blot analysis was also performed on both the N-GFP-UL142 and UL142-GFP-C-transfected cell lysates, and a sample of each lysate was digested with endo-N-acetylglucoseaminidase H (EndoH): the results show that GFP-tagged UL142 is ∼100 kDa and after EndoH treatment is slightly larger than 67 kDa suggesting the loss of ∼30 kDa of N-linked carbohydrate which is in agreement with the NetNGlyc prediction that UL142 is heavily glycosylated. No EndoH-resistant fraction was detectable (Fig. 3⇓B). UL142 is expressed at the cell surface and is glycosylated. A, Fibroblasts transfected with GFP-UL142 (i) cytoplasmic GFP expression (ii) nonpermeabilized cells stained with anti-GFP and anti-mouse TRITC show cell surface staining (iii) merge (iv) nonpermeabilized cells stained with mouse isotype control and anti-mouse TRITC show no surface staining. B, Cells transfected with GFP-UL142 and UL142-GFP: some of each lysate was digested with EndoH before all samples being analyzed on an 8% polyacrylamide gel. Western blots were stained with anti-GFP Ab followed by anti-mouse HRP. Functions encoded by strains Toledo or TB40e, but not strain AD169, provide for greatly enhanced protection against NK cell-mediated cytolysis during the late phase of infection. Therefore, we sought to investigate whether UL142 was capable of modulating NK recognition when expressed in isolation or in the context of virus infection. If UL142 expression was responsible for inhibiting NK cell lysis, cell lines expressing the gene should show increased resistance to NK cell lysis. We produced U373 cell lines stably expressing UL142, which were monitored for UL142 mRNA expression by RT-PCR. Polyclonal NK lines from two donors were generated and U373 cells expressing UL142 or control U373 cells were used as target cells. The results were very similar using both polyclonal NK cell lines and showed that expression of UL142 was able to significantly inhibit the lysis of the U373 target cells (Fig. 4⇓A). These results suggested that gpUL142 could function to inhibit NK cell-mediated lysis, albeit in a nonautologous target cell system. We next wished to determine whether UL142 expression in primary human fibroblasts could inhibit lysis by autologous polyclonal NK cell lines derived from both HCMV seropositive and seronegative donors. Fibroblasts were infected with a replication-deficient RAdexpressing UL142 (RAd 586) or a control adenovirus (RAd 592) and used as targets for polyclonal NK cell lines derived from five donors (Fig. 4⇑B). The results showed that UL142 expression could inhibit lysis by polyclonal NK cells derived from some donors but not others, and that the level of inhibition was variable. The polyclonal NK cell line derived from donor 024 was not inhibited, that from donor 019 was slightly inhibited, and significant inhibition of NK cell lines derived from donors 023, 018, and 013 was observed. It has become clear that polyclonal NK cell lines derived from a single donor are composed of individual NK cells expressing a diverse repertoire of activating and inhibitory NK cell receptors (33). It thus seemed likely that individual NK cell clones might respond differently when they encounter HCMV-infected cells: consistent with this, previous work by Parham and colleagues (35) using AD169-infected fibroblasts demonstrated that individual NK cell clones could be inhibited and, in some cases stimulated, by HCMV-infected cells. One explanation for our results using polyclonal lines is that some clones can be inhibited by UL142 expression while others are unaffected and the magnitude of the inhibition observed is a function of the frequency of UL142 sensitive clones in any given polyclonal NK cell line. To test this hypothesis, we derived multiple individual NK cell clones by a limiting dilution technique and used these against target cells infected with HCMV strain AD169 or Toledo, and fibroblasts expressing UL142 alone. One hundred clones were derived from five donors and tested in cytotoxicity assays against autologous fibroblasts infected with a RAd-expressing UL142 or a control adenovirus. Twenty-three of the clones were inhibited by UL142 expression: NK cell clones that could be inhibited by UL142 expression were more readily isolated from donors 013, 018, and 023, consistent with the polyclonal NK cell data (Fig. 4⇑B; Table II⇓). It appears that HCMV seropositive donors tend to have a higher frequency of NK clones inhibited by UL142 but this is not significant when the two groups are compared using a two-tailed Student’s t test with unequal variance (p value of 0.119). Thirty-one clones derived from donors 013, 018, and 023 were studied in more detail, using target cells expressing UL142 alone as well as target cells infected with either HCMV strains AD169 or Toledo and uninfected fibroblasts (Fig. 5⇓). All 31 clones were inhibited by fibroblasts infected with HCMV Toledo, and four distinct patterns of cytotoxicity against the panel of target cells could be recognized. Pattern A (8 of 31 clones): fibroblasts infected with AD169 or Toledo were not lysed; 7 of these were inhibited by targets expressing UL142 alone. Pattern B (17 of 31 clones): AD169 infected fibroblasts were lysed to the same extent as uninfected fibroblasts (i.e., were not protected from lysis), although Toledo-infected cells were protected: 7 of these were inhibited by targets expressing UL142 alone. Pattern C (6 of 31 clones): AD169-infected fibroblasts were lysed to a greater extent than uninfected fibroblasts (suggesting that these clones were activated by AD169 infection): five of these were inhibited by targets expressing UL142 alone. Pattern D (19 of 31 clones): all the clones were inhibited both by Toledo-infected fibroblasts and by fibroblasts expressing UL142 alone, seven were also unable to lyse AD169infected fibroblasts, seven lysed AD169-infected fibroblasts to the same level as uninfected targets and five lysed AD169-infected fibroblasts to a greater extent than uninfected fibroblasts (Fig. 5⇓). Analysis of individual NK cell clones shows variable inhibition of lysis by UL142. Thirty-one NK cell clones were derived and used as effector cells against autologous fibroblasts infected with HCMV or a RAd-expressing UL142. The clones displayed distinct patterns of cytotoxicity, and examples of each are shown. A, AD169-infected fibroblasts were able to inhibit 8 of the 31 clones tested. B, Seventeen of the 31 clones lysed AD169 and uninfected cells to the same level. C, Six of the 31 clones were activated by AD169-infected cells; D, all of the clones were inhibited by Toledo-infected fibroblasts. E, Nineteen of the clones tested were inhibited by fibroblasts expressing UL142 alone. These results would predict that cells infected with a UL142 knockout virus would be more susceptible to NK-mediated lysis. Although a bacterial artificial chromosome of HCMV Toledo is available and could be used to construct a UL142 deletion virus, it is not widely appreciated that this current Toledo-bacterial artificial chromosome also has the US2-US7 genes deleted (34): it is thus unable to cause MHC class I down-regulation on infected fibroblasts (data not shown). This renders it unsuitable for analyzing the phenotype of UL142 knockout-infected cells. Therefore, we used siRNA transfected into primary fibroblasts to knockdown UL142 expression in infected cells and assessed the extent of UL142 knockdown using RT-PCR compared with a control scramble siRNA transfection. This routinely resulted in substantial knockdown of UL142 mRNA expression without affecting expression of an irrelevant viral (pp65) or cellular gene (GAPDH) (Fig. 6⇓A). We then used siUL142-transfected fibroblasts superinfected with HCMV as targets in cytotoxicity assays against two polyclonal NK lines: as predicted the knockdown of UL142 in these infected cells rendered them more sensitive to NK-mediated lysis. We also generated four clones from donor 018, two of which were able to lyse siUL142-transfected HCMV-infected cells to a greater extent than infected control cells (Fig. 6⇓B). siRNA-mediated knockdown of UL142 increases susceptibility to NK cell-mediated lysis in HCMV-infected fibroblasts. A, Fibroblasts were transfected with control scrambled siRNA or a mixture containing two separate siRNAs to UL142, and transfected cells were then infected with HCMV Toledo at an moi of 2–0.125. RNA was extracted 72 h postinfection and levels of UL142 expression (with pp65 and GAPDH as controls) determined by RT-PCR. B, Fibroblasts transfected with control scrambled siRNA or siUL142 were used as target cells against two independent polyclonal NK cell lines and two NK clones: reduced UL142 mRNA expression increases their sensitivity to NK-mediated lysis. We used an autologous system to investigate the resistance to NK cell killing induced in infected cells by low and high passage strains of HCMV, and showed that this is associated with the late phase of infection with HCMV strain Toledo when levels of surface MHC class I are low. We predicted HCMV gpUL142 to be an MHC class I-related molecule using a bioinformatics tool (3D-PSSM). This structural homology was also independently predicted by sequence alignment of UL142 with HCMV UL18, human MHC class I and chimpanzee CMV (18), providing independent confirmation of our suggested class I-like secondary structure for UL142. It is clear from experiments using polyclonal NK cell lines, either by knockdown or over expression, that UL142 is able to inhibit NK function. However, the level of inhibition was never as strong as that observed with wild type Toledo virus. Our detailed analysis of 31 NK cell clones from three donors showed all of them were inhibited by Toledo-infected cells, of which eight were also inhibited by AD169. This suggested that these clones could be inhibited by the action of one or multiples of the UL16, UL18, UL40, or UL83 gene products. Nineteen of the 31 clones were specifically inhibited by UL142 expressed in isolation. Five other clones were activated by AD169-infected fibroblasts: this is in agreement with a previous analysis using NK cell clones and primary fibroblasts from the same donor, which also showed that some clones could lyse AD169-infected fibroblasts while others were inhibited (35), consistent with polyclonal NK cell lines being composed of many different NK cell clones. Although all of these NK cell clones we studied were inhibited by Toledo-infected fibroblasts, 12 were not inhibited by UL142 expressed in isolation. This implies that clinical strains of HCMV must encode yet further NK evasion functions. During the course of this study it was reported that another gene within the Ulb′ region, UL141, inhibits NK cell-mediated lysis in a clonally dependent manner by sequestering CD155 in the ER and thus preventing it from engaging DNAM-1 an NK activating receptor. In this analysis, 66% of the NK clones from four individuals were shown to be inhibited by UL141 expression in autologous fibroblasts (19). This observation may well explain why some of the NK cell clones in our study were not inhibited by UL142 expression although all were inhibited by Toledo-infected fibroblasts. gpUL142 could function to evade NK cell-mediated lysis by at least two mechanisms: 1) UL142 could ligate an inhibitory NK cell receptor or 2) UL142 could sequester a stress/infection induced NK activating receptor ligand. It has been recognized for some time that HCMV encodes a MHC class I-like molecule, gpUL18, which binds to the inhibitory NK receptor LIR1/ILT2 with high affinity and has been shown to inhibit NK cell-mediated lysis. gpUL142 has a number of interesting features when compared with gpUL18. It is shorter, and would only contain an α1 and disulfide bonded α2 domain but not an α3 domain, seen in classical MHC class I molecules (and in gpUL18). At present we do not know the localization of UL142 protein in the virus-infected cell: specific Abs are presently being raised to UL142. UL142 is predicted to encode both a leader signal sequence and a short transmembrane region. Analysis of cells transfected with N- and C-terminal GFP-tagged UL142 suggests that UL142 is expressed in the cytoplasm of these cells. However UL142 can also be detected on the cell surface, and EndoH digestion confirmed the bioinformatics prediction that UL142 is highly glycosylated. It is interesting to note that the gpUL18 MHC class I homologue encoded by all strains of HCMV is also heavily glycosylated and is also expressed at the cell surface using over expression systems, but is difficult to detect on the surface of HCMV-infected cells. The mechanism by which UL142 might mediate resistance to NK cell killing is as yet unclear. In the MCMV model, an MHC class I-related molecule (m157) has been shown to mediate NK inhibition by engaging inhibitory receptors on NK cells (36). However, 11 other ORFs in MCMV were also shown to have MHC-like folds and to be transmembrane glycoproteins (26). Three of these, m145, m152, and m155 have subsequently been shown to sequester stress-induced molecules (MULT1, RAE1, and H60, respectively) that would normally engage the NKG2D-activating NK receptors and interfere with NK cell activation and virus control (27, 28, 29, 30). UL16 of HCMV is known to sequester only some of the human ligands for NKG2D: it does not affect MICA or ULBP3. Further, members of this family which also bind NKG2D, ULBP4 and RAET1G, have recently been described and it is not known whether they are affected by HCMV infection (37, 38). Given that MCMV has evolved genes to target all the murine NKG2D ligands and they are themselves MHC class I-related molecules it is possible that UL142 functions in a similar fashion. Additional experiments are in progress to address these possibilities. The question arises of why HCMV encodes so many different mechanisms to apparently evade NK cell-mediated lysis? The observation that NK cell populations are heterogeneous, expressing a variety of inhibitory and activating receptors (39) and that different individuals have different NK receptor profiles (40) may provide an explanation. The HCMV-infected cells are likely to come into contact with a diverse repertoire of NK cell receptors, and multiple mechanisms will need to be used by the virus to maximize the chance of inhibiting NK function. It should be noted that virus-mediated NK inhibition is not total: specific lysis of Toledo-infected cells is never zero with polyclonal NK lines, in our own and all other experiments, and the overall level of inhibition varies between different donors. Why does the induction of fibroblast resistance to NK lysis by clinical strains of virus occur late in the virus cycle? In vivo, HCMV maintains a latent infection (41), with reactivation of viral lytic gene expression ultimately producing new viral particles. This reactivation will necessarily require a window of opportunity during which the virus will, crucially, have to evade the memory CD8+ CTL response. This is mediated by expression of viral gene products such as US2, US3, US6, and US11. US3 is expressed from 4 h postinfection. US2, 6, and 11 are expressed from 8 to 12 h and continue to be expressed up to 120 h postinfection (42). Therefore, this interference with the MHC class I pathway, preventing the presentation of processed viral peptides to CD8+ T cells, will ensure immune avoidance from the very earliest times of infection. However, surface MHC class I is progressively lost from the infected cell and at some point, the level of MHC class I on infected cells will be insufficient to inhibit surveying NK cells, although importantly this will not occur at immediate early times of infection. It is interesting to note that genes implicated in NK evasion are expressed from early times onwards: UL16 is expressed early and accumulates to late times (as NK-activating stress ligands are rapidly induced postinfection) (43), UL40 is also expressed early (11) followed by UL18 from 54 h (42), UL141 is also expressed early and accumulates and UL142 mRNA is a late gene. Thus, the multitude of HCMV encoded NK evasion genes may have evolved to inhibit a diverse functional repertoire of NK cell receptors, and to act at later times of infection when the reduction of MHC class I, essential for avoidance of CTL immune surveillance, would necessarily compromise the MHC class I-mediated inhibition of surveillance by NK cells. We conclude that the work described here provides good evidence for UL142 being an additional HCMV gene which functions to evade NK cell killing of virus-infected cells. The growing number of such genes known to be encoded by HCMV argues for NK cells having exerted selective pressure on the virus, and thus presumably being an important component of innate defense against HCMV. We thank Eddie Wang and Andrew Davison for helpful discussion. ↵1 This work was supported by a Medical Research Council Programme grant, a Cooperative Group grant, and a Wellcome Trust studentship. ↵3 Abbreviations used in this paper: HCMV, human CMV; ER, endoplasmic reticulum; ORF, open reading frame; siRNA, small interfering RNA; BCL, B cell line; HFF, human foreskin fibroblast; cpe, cytopathic effect; moi, multiplicity of infection; RAd, recombinant adenovirus; MCMV, murine CMV; PPF, phosphonoformic acid; EndoH, endo-N-acetylglucoseaminidase H.
Karre, K., H. G. Ljunggren, G. Piontek, R. Kiessling. 1986. Selective rejection of H-2-deficient lymphoma variants suggests alternative immune defence strategy. Nature 319: 675-678. Ravetch, J. V., L. L. Lanier. 2000. Immune inhibitory receptors. Science 290: 84-89. Fletcher, J. M., H. G. Prentice, J. E. Grundy. 1998. Natural killer cell lysis of cytomegalovirus (CMV)-infected cells correlates with virally induced changes in cell surface lymphocyte function-associated antigen-3 (LFA-3) expression and not with the CMV-induced down-regulation of cell surface class I HLA. J. Immunol. 161: 2365-2374. Falk, C. S., M. Mach, D. J. Schendel, E. H. Weiss, I. Hilgert, G. Hahn. 2002. NK cell activity during human cytomegalovirus infection is dominated by US2-11-mediated HLA class I down-regulation. J. Immunol. 169: 3257-3266. Sutherland, C. L., N. J. Chalupny, D. Cosman. 2001. The UL16-binding proteins, a novel family of MHC class I-related ligands for NKG2D, activate natural killer cell functions. Immunol. Rev. 181: 185-192. Cha, T. A., E. Tom, G. W. Kemble, G. M. Duke, E. S. Mocarski, R. R. Spaete. 1996. Human cytomegalovirus clinical isolates carry at least 19 genes not found in laboratory strains. J. Virol. 70: 78-83. Tomasec, P., E. C. Wang, A. J. Davison, B. Vojtesek, M. Armstrong, C. Griffin, B. P. McSharry, R. J. Morris, S. Llewellyn-Lacey, C. Rickards, et al 2005. Down-regulation of natural killer cell-activating ligand CD155 by human cytomegalovirus UL141. Nat. Immunol. 6: 181-188. Wills, M. R., A. J. Carmichael, K. Mynard, X. Jin, M. P. Weekes, B. Plachter, J. G. Sissons. 1996. The human cytotoxic T lymphocyte (CTL) response to cytomegalovirus is dominated by structural protein pp65: frequency, specificity, and T cell receptor usage of pp65-specific CTL. J. Virol. 70: 7569-7579. He, T. C., S. Zhou, L. T. da Costa, J. Yu, K. W. Kinzler, B. Vogelstein. 1998. A simplified system for generating recombinant adenoviruses. Proc. Natl. Acad. Sci. USA 95: 2509-2514. Fischer, D., C. Barret, K. Bryson, A. Elofsson, A. Godzik, D. Jones, K. J. Karplus, L. A. Kelley, R. M. MacCallum, K. Pawowski, et al 1999. CAFASP-1: critical assessment of fully automated structure prediction methods. Proteins Suppl. 3: 209-217. Kelly, L. A., R. M. MacCallum, M. J. E. Sternberg. 2000. Enhanced genome annotation using structural profiles in the program 3D-PSSM. J. Mol. Biol. 299: 501-522. Nielsen, H., J. Engelbrecht, S. Brunak, G. von Heijne. 1997. Identification of prokaryotic and eukaryotic signal peptides and prediction of their cleavage sites. Protein Eng. 10: 1-6. Lodoen, M. B., G. Abenes, S. Umamoto, J. P. Houchins, F. Liu, L. L. Lanier. 2004. The cytomegalovirus m155 gene product subverts natural killer cell antiviral protection by disruption of H60-NKG2D interactions. J. Exp. Med. 200: 1075-1081. Benedict, C. A., K. D. Butrovich, N. S. Lurain, J. Corbeil, I. Rooney, P. Schneider, J. Tschopp, C. F. Ware. 1999. Cutting edge: a novel viral TNF receptor superfamily member in virulent strains of human cytomegalovirus. J. Immunol. 162: 6967-6970. Penfold, M. E., D. J. Dairaghi, G. M. Duke, N. Saederup, E. S. Mocarski, G. W. Kemble, T. J. Schall. 1999. Cytomegalovirus encodes a potent α chemokine. Proc. Natl. Acad. Sci. USA 96: 9839-9844. Parham, P.. 2004. Killer cell immunoglobulin-like receptor diversity: balancing signals in the natural killer cell response. Immunol. Lett. 92: 11-13. Hahn, G., D. Rose, M. Wagner, S. Rhiel, M. A. McVoy. 2003. Cloning of the genomes of human cytomegalovirus strains Toledo, TownevarRIT3, and Towne long as BACs and site-directed mutagenesis using a PCR-based technique. Virology 307: 164-177. Carr, W. H., A. M. Little, E. Mocarski, P. Parham. 2002. NK cell-mediated lysis of autologous HCMV-infected skin fibroblasts is highly variable among NK cell clones and polyclonal NK cell lines. Clin. Immunol. 105: 126-140. Jan Chalupny, N., C. L. Sutherland, W. A. Lawrence, A. Rein-Weston, D. Cosman. 2003. ULBP4 is a novel ligand for human NKG2D. Biochem. Biophys. Res. Commun. 305: 129-135. Valiante, N. M., M. Uhrberg, H. G. Shilling, K. Lienert-Weidenbach, K. L. Arnett, A. D’Andrea, J. H. Phillips, L. L. Lanier, P. Parham. 1997. Functionally and structurally distinct NK cell receptor repertoires in the peripheral blood of two human donors. Immunity 7: 739-751. Shilling, H. G., L. A. Guethlein, N. W. Cheng, C. M. Gardiner, R. Rodriguez, D. Tyan, P. Parham. 2002. Allelic polymorphism synergizes with variable gene content to individualize human KIR genotype. J. Immunol. 168: 2307-2315. Sissons, J. G., M. Bain, M. R. Wills. 2002. Latency and reactivation of human cytomegalovirus. J. Infect. 44: 73-77. Kaye, J., H. Browne, M. Stoffel, T. Minson. 1992. The UL16 gene of human cytomegalovirus encodes a glycoprotein that is dispensable for growth in vitro. J. Virol. 66: 6609-6615.